In this section, we will look at various types of ‘Rigs’ that Carp Anglers all over the world use in pursuit of their quarry. Now, many of these set ups originated in England where the fish are under a great deal of Angling pressure and the rigs described were devised out of necessity for the capture of shy biting, highly-pressured fish. Many of the fishing situations out here in the U.S.A will not require the use of such rigs but understanding their individual functions and the fishing conditions that they were developed for, may be of use in certain situations. For example, fishing a heavily silted water at distance as opposed to a hard-bottomed water in the margin regions may require the use of a helicopter or possibly a Chod rig for better bait presentation. If the fish are feeding in the upper layers of the water, then a Zig-Rig may be the best option. The rigs will be listed with observations as to their original design and use so that you can apply them if needed to your individual fishing situation. This is not a comprehensive list of all rigs but some of the most commonly used. Traditionally bait has been placed directly onto a hook, whether it is a dough bait that surrounds the hook or a kernel or two of sweet corn that is pierced by the hook point and mounted onto the shank of the hook. The ‘Hair Rig’ was the rig that would literally re-write the history books for many carp anglers, and was developed by Len Middleton and Kevin Maddocks in England during the late 1970’s. The name comes from the material by which the bait was originally attached to the hook, not being directly pierced by the hook itself, the bait was mounted on a piece of ‘human hair’ that was attached to the hook so there was no association with a hook-length material and the bait presented, by the feeding Carp. The rig was devised out of necessity as tests had proven that Carp were quick to associate danger with both the feeling of monofilament line within the mouth and a presented bait that did not react naturally when being ‘investigated’ by the fish. During the test the Carp would pick up all of the free offerings and completely ignore the hook-bait! When first investigating a potential food item, the carp will first ‘mouth’ the bait to determine whether it is a food source and then pass it to the pharyngeal teeth towards the back of the throat. It is in the initial process that the carp were rejecting all the ‘hooked’ baits during the tests and shying away from the fishing line associating it with danger. . The invention of the ‘Hair Rig’ dramatically increased catch rates for Len and Kevin and the Carp history books were changed forever. A simple ‘Hair Rig’ can be tied using any form of hook-length material with a ‘Knotless knot’. The bait is mounted on the ‘Hair’ so that it sits away from the hook and the length of the hair can be adjusted to suit the various fishing conditions. Note: You will find that at some waters, a longer hair will work better than a shorter one (like the one pictured below). The length will of course also depend on the bait size you decide to use and how the fish are feeding. Experiment with the length of hair for what suits your fishing conditions best. We've found that the best hair length to start with is one where the closest piece of bait on the hair to the hook bend, should be 1/4" below the curve of the hook when you dangle the rig vertically. A ‘Pop up’ Rig is exactly as it sounds. It is a rig that allows a buoyant bait to be presented ‘Popped up’ from the lake bed. This can be useful when the presence of extended debris on a lake bed impairs the presentation of a traditional ‘bottom’ presented bait. A buoyant bait must be used and some form of anchor, such as rig putty or a split shot placed on the hook-length to pin it to the lake bed. 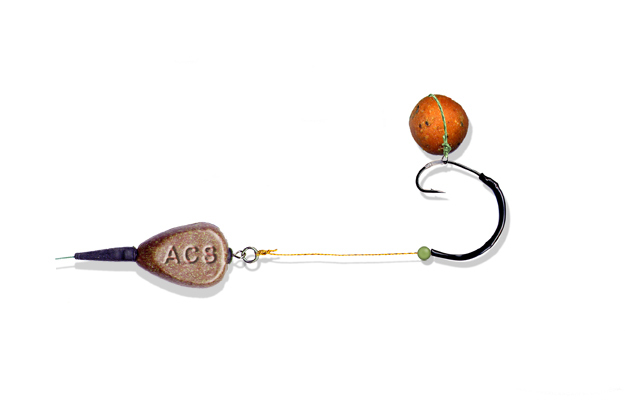 The length of the ‘popped up’ bait can be adjusted by altering the distance of the putty weight from the hook. This rig usually incorporates the use of a longer ‘shanked’ hook and a supple braid-type material for the hook-length / hair part of the rig. Although, if tied carefully, can be very successfully employed on a short-shanked hook too! The bait is mounted on a hair that is tied to a sliding ring on the shank of the hook. The supple braid allows independent freedom of movement of the bait from the hook. When a fish "picks up" the bait and then ‘blows’ it back to reject it for any reason the bait will travel independently of the hook, therefore allowing the hook to stay within the fish’s mouth, almost always pricking the fish in the bottom lip. As its name implies, this rig uses a ‘stiff’ heavy monofilament material or ‘Bristle filament’ as opposed to a braided or ‘soft’ hook-length. The Stiff rig has several uses but the primary purpose is to make the ejection of the hook very awkward for the carp due to the angle that the hook sits in relation to the actual hook-length. The stiff ‘boom’ also gives direct contact with the lead in a bolt rig situation, thus this is a great Winter rig for when the carp are not very active or moving. The ‘stiffness’ of the hook-length also has great ‘anti-tangle’ properties that can be experienced with softer hook-lengths when being cast. The stiffer the material, the more of a ‘boom’ effect will be present allowing the hook and bait to fall ‘away’ from the lead when it is cast. This rig gets its name from the ‘D’ shape of the hinge that the hair rigged bait is joined to. The D rig, as the blowback rig, allows independent movement of the hook from the bait. Usually formed with stiff monofilament or a plastic coated braided hook-length, the would be ‘hair’ is doubled back and passed through the eye of the hook a second time after having an ‘O ring’ threaded. A naked flame from a lighter or match is used to melt the end of the hair and that will then form a ‘stop’ on the end of the original hair as the plastic material burns to a blob and stops it pulling back through the hook's eye. This forms the ‘D’ part of the rig. A ‘hair rigged’ bait can then be attached to the ‘O’ ring allowing independent freedom of movement for the rigged bait. Another way of presenting a ‘Pop-Up’ bait but with independent movement of the hair. Usually used for ‘Pop Up’ presentations only. This Rig is a combination of the Stiff Rig with a braided end section like that of the Blow Back Rig, that incorporates the properties of the ‘Stiff Boom’ of the stiff rig (Anti-tangle and direct contact to lead) and the anti-eject properties of the ‘Blowback’ Rig. The end ‘hinged’ section can be used not only with the blowback end rig combination but with many others also, as shown in the example below. The ‘hinge’ at the end of the ‘boom’ is usually either an ‘O’ ring for an angled end part of the rig where no independent movement is required or a swivel with an ‘O’ ring incorporated for complete independent movement of the end section of the rig from the ‘Stiff’ boom section. A version of the combi rig can also be achieved by stripping back the plastic outer coating of a coated hook-length material that many manufacturers such as Kryston, Nash, Korda etc. currently supply. This is a term given to a rig with three or more baits on the ‘hair’. This rig works well with both large size boilies on the ‘Bottom’ and in Winter smaller than usual boilies ‘Popped-Up.' Will work well with a variety of leader materials from stiff to supple braids. This rig was designed specifically by Steve Renyard in the early 90's for the carp at Withy Pool fisheries in England that were very cautious feeders. A buoyant pop-up bait is essential to help this rig work it's magic. It incorporates a long shank hook, free moving ‘O’ ring with a curved shrink tube attachment making it a very hard rig for a fish to eject once it takes in the bait. Whilst not an essential rig on US waters at this time, It may be one that you'll like to have in your locker to pull out for "game-times" when the bites are coming very slow and finicky. It'll catch you fish, no doubt! The rig was named the helicopter rig after its 360 degree ‘helicopter blade’ like motion when cast. The hook-link rotates around the main-line by a loose-fitting hook-link swivel. The main line is usually shielded with anti-tangle tubing or lead-core is used. This rig is used for silty lakes where the lead weight sinks in to the soft, silty lake bed; in this case, the bait will remain above the silt and in full view of the Carp. The Helicopter rig is also used when distance is needed on the cast, it has great anti tangle properties. This rig was named because of the effect that it has when picked up by the carp. It should ALWAYS be used with a safety feature of some sort such as a safety clip or soft rubber tubing for an inline lead. The bolt rig has a ‘semi-fixed lead weight’ attachment not allowing any ‘free running’ of the fish without resistance. This means that when the fish picks up the bait and starts to move away it feels the resistance of the lead weight after getting "pricked" by the hook, it scares, then bolts (think of a horse bolting across the field after being spooked) then the weight of the lead weight/sinker sets the hook in the process. The safety clip or rubber tubing feature found in all good inline leads/sinkers will allow the safe shedding of the lead should the fish break off during retrieve, therefore causing no harm to the fish. The Chod rig is a specially designed rig for use with very buoyant, pop-up baits. The hook length is tied with a short (usually 3" or less) very stiff mono or Fluorocarbon/mono hi-bred line so that the hook-length material forms a "C" curve. This can be done with steam from a boiling kettle (Please be careful!). 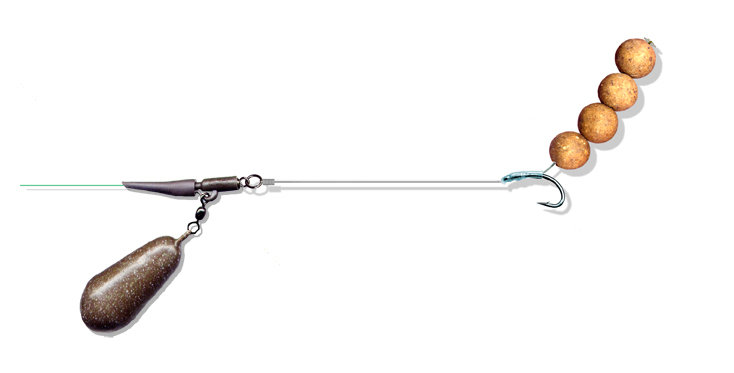 Very similar in nature to the Withy Pool rig shown above and works with the same mechanics as a professionally tied paylake rig does. Once sucked into the Carp's mouth, it is very difficult for the carp to then eject the bait; also, the very nature of the stiff, curved rig turns the hook round inside the mouth pricking the bottom lip. Quite similar in concept to a typical Pay-Laker's hook length. The curved and stiff hook-length is then usually threaded onto a length of lead core tied to the end of the mainline. The hook-length is then held in place on the lead-core by rubber beads threaded on to the lead core either side of the swivel connecting the hook-length. This rig takes its name from the appearance of a ‘Medusa’ head when completed. It is generally used with a piece of cork or other buoyant material that maggots or mealworms can be attached too. This can be achieved in several ways such as with the use of ‘superglue’ directly to the individual baits or by threading them through with a needle and thread and then attaching them to the cork-ball by wrapping the thread around the glue covered ball. There is also purpose made bait rings that attach to the hair, these are a lot less hassle to use with the maggots or mealworms etc. because you just thread the bait onto the ring and then attach to the hair thus no messing with glues and the like. Use foam to pop them up if required. A ‘Zig Rig’ usually comprises of a fluorocarbon hook-length and can be fished with either a running or ‘Fixed’ lead set-up. It is used when the fish are feeding neither on the ‘Surface’ of the lake, nor the ‘bottom’ and is used to suspend a buoyant bait anywhere in between where the fish are present. This may be 3 feet below the surface in a 12ft swim or 6 feet from the bottom in a 20ft swim. A highly buoyant bait must be used to keep the bait presented off the bottom at the correct depth. Note: Also see the Zig Rig and associated kit that is presented in the Surface Fishing section of our website. A ‘Critically’ balanced rig is a term that is given to a rig that is neutrally ‘balanced’ in weight when in the water, meaning that the buoyancy of the hook-bait offsets the weight of the hook. This is achieved by placing a buoyant bait (pop-up boilie or plastic, fake maize etc.) on the hair of the rig, either in combination with or, in place of a conventional bottom" bait. This allows the baited hook-length to fall naturally through the water and also to act as any ‘free’ offering would on the bed of the lake. This rig takes some of the properties of the stiff rig but still allows a supple hook-length material to be used if needed. A piece of shrink tubing is usually placed over the shank of the hook and bent at a slight angle towards the hook's barb when the tube is in the shrinking process. Employing the shrink tubing in this manner creates an artificial ‘extension’ of the hook-shank making the bait much harder for the fish to eject, also causing the hook to turn easier in the Carp's mouth providing a more certain hook hold in the lower lip of the fish. Great for both bottom baits and ‘Pop-Ups’.